Orange County, Florida used to be one of the largest citrus producers in the state. But it got too cold there, and the citrus industry is nearly gone. Orange County at one time was one of the top five producers of citrus ….. a freeze in the 1950s had wiped out most of the tangerine production ….. At just 2,300 acres today, the amount of ground covered in trees is down 50 percent in the last 10 years and is just a tiny fraction of the some 50,000 acres of groves in Orange County before the freezes of the 1980s. …. Yep! Many former groves around my mother’s property are now huge equestrian complexes. Horse people discovered that the soil imparts nutrients in the grasses that improves bone health in those manure machines. Only private groves now remain, and most of those are succumbing to the greening disease. Oranges are clearly racist, homophobic, transphobic, islamophobic, white supremist, climate deniers. Well, if the citrus farmers actually followed the science behind global warming, they would have realized that they needed to replant their groves in more “northerly” locations, in the “new citrus” belt. As the Arctic is warming more rapidly than any other region on the planet, the warmth flows from North to South now, following the Rossby Waves. This should be evident from all of the snowfall in the United States this year; as the much warmer air is saturated with moisture it has no recourse but to release all that energy and moisture as “bomb cyclones” producing epic blizzards in their wake. Moreover, we should note that climate science is complicated and that warmer northern locales could be subject to unforeseen negative feedback loops and abrupt freezes from bizarre Warming Holes, that defy climate change. If you want to put a stop to all of this, just remember that there is only one political party in the United States that can control the weather! …………… Our galloping magnetic north is pulling the magnetosphere tight on that west side as the Mass Gravitational field laying under the eastern side makes a Much better Magnetic shield. Same exact thing is happening on the South pole, but transposed. As a child, I remember climbing to the top of Citrus Tower and overlooking acres and acres of citrus groves. It smelled so good when the trees were blossoming. Orlando was surrounded by them. Now it’s hotels and restaurants and Disney property, etc. A lot of swampland in S. Florida was developed, converted to citrus and there was less risk of frost and most production moved there. Yes. The center of Florida citrus is now Indian River County, northeast of Lake Okeechobee. Of course, not as much as before in Orange County since the frozen concentrate business has mostly moved to Brazil. Hate to contradict you on this, but citrus does not grow well on the type of soil that resilts from drained swamps. Citrus is planted in well drained sandy soils. Soils which are heavy, or dense, poorly drained, or even high in organics or clay, will never grow citrus well. Citrus tower sits smack dab in the middle of the Highland Ridge, a long, narrow, and surprisingly high strip of sand hills. Not too far from Citrus Tower is Sugerloaf Mountain, el. 312 feet. Close also to Howey-in-the-Hills, one of those head scratcher of a place-names that Florida has so many of. Even farther north and west, is Citrus County. Anyone want to take a wild guess how a place where no citrus (well, except Ballamy Groves) is grown got that name? Wiped out in the Great Freeze of 1894-95. Which as one might infer from the fact that it spanned two years, was a actually a series of freezes. It is very strange how it can and does go decades at a time with no weather anywhere close to being cold enough to kill citrus in Florida, and then such weather does come, but almost always in batches of years, and even during those years it is typically a one or two night thing. They are not randomly spaced over time at all. But it is also hard to peg them very well with global warming and cooling trends. That is true about the need for well drained soils. As I understand it, by digging trenches and creating elevated sections in between, one can convert lowlands into productive citrus groves. This was done extensively around La Belle and Southwestern FL. I travel through high-density apple (& other fruit) orchards in the Wenatchee & Quincy area of Washington State. In Florida, with the climate issues, disease, and urban development southern growers are also reestablishing orchards with the high-density systems, and intensive management. Locations may shift and total area can decline, while fruit quality and yield per acre increases. Researchers and new approaches will get a handle on the disease and the industry will continue. Cold and frosts are another matter. I’ve wondered if someone isn’t trying growing in poly-tunnels, as is done with black berries? Florida is very hot, and poly tunnels trap heat. Citrus needs chilly nights to get the maximum amount of sugar in the fruit. Lots of fruits actually need some weather than is cold but not too cold, and typically require it to occur at a certain time of the year. Very hard to grow peaches in Florida, because there are not enough cool nights in most of the peninsula. But they did recently breed a variety that can grow here, requiring a minimal amount of chilling to set buds. Also the UV is intense here, and there is a lot of it over a year. Even UV treated poly gets brittle fairly quickly in FL. Also killing freezes are so rare. 25 years now since the last one. It has to be pretty cold and stay cold for more than 4 hours to damage citrus at all. Most orange varieties have to be below 28 for 4 hrs or more. And they are always coming strains. Although diseases have a habit of being particularly hard on novel strains. But the main thing is, each different sort of plant or tree requires specific conditions to grow well, and the economics of growing are typically fairly constrained. You cannot just go sticking any old kind of tree inside a plastic enclosure. You might protect from the once every few decades freeze, but kill the trees in a month from fungus. Interestingly though, citrus greening may be able to be eliminated from a tree by heating the tree to 125° for a short time, a treatment which kills the bacteria but that the tree can survive for a certain amount of time. Placing a poly tent over trees will give such a temp on a sunny day within a few minutes. But it has to be done carefully. A little too hot, or a little too long, and the tree is a goner. 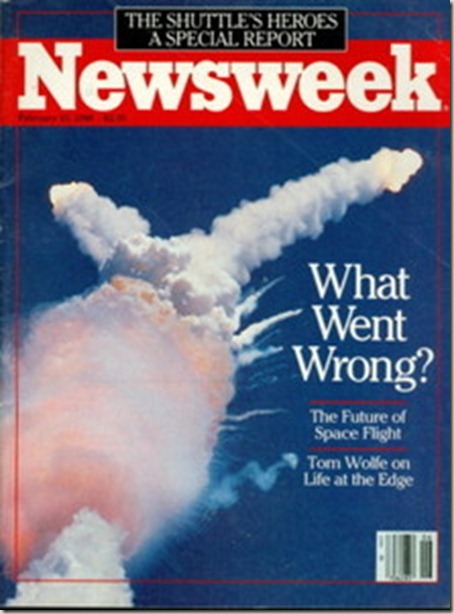 During that same time it also became too cold to launch people into Space from Florida (just in case someone thinks this is orange tree story is a conspiracy paid for by Exxon). Seriously, we drove through dead orchards on our way to take the kids to Disney in Orlando. With all the devastation it looked like a war zone. Amazing what a little “warming” can do. I can recall that day very well. I walked out of a Physical Chemistry class at USF and looked East, knowing the shuttle had probably already taken off. Saw a Y-shaped cloud that ended suddenly, instead of the usual straight one curving away and getting smaller as it went up. It was 17°F at our farm that morning, which is almost exactly due east of the Cape, about 90 miles, near a town called Darby. Among the missing citrus is my favorite, the Temple orange, with too little production left to supply northern demand. 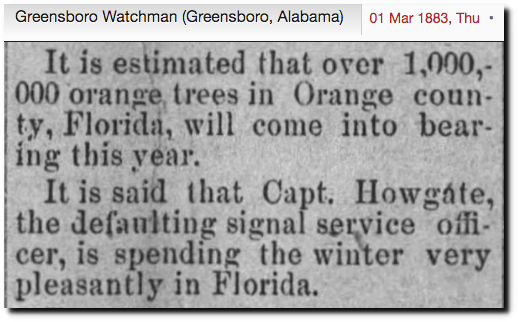 I think I remember orange trees into southern Georgia back in the early 1950s, also now gone. 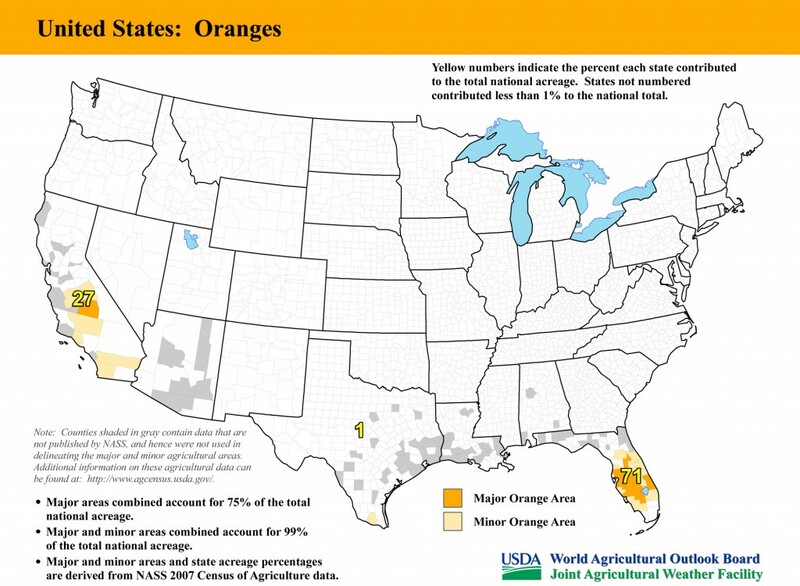 Of course, citrus groves spread across the southern states since, but frost seems more frequently a problem for them. Citrus across the south, but not oranges. Too cold almost every year for them to survive, outside of the Florida Peninsula and California, a little bit of Arizona and Texas. Microclimates though, can allow for survival of almost any tree in any location. There are some places in even far northern states that tropical plants have survived outside for decades. Here you go…you can order them directly. Up through late 1800s there were still commercial groves in north-east Florida, hence there are still towns there named “Orange Park”, “Mandarin”, etc. Last 100 years or so has shifted the hard freeze line toward the south. Nice post Tony. Tim Ball has hammered on this point…to academics and media-types, getting climate trends wrong means nothing, but to farmers – its everything. Dr. Ball mentions the impact on wheat growers in the Canadian prairie. If the Alarmists tell us warming but in fact we are in a cycle of cooling then it can be catastrophic to farmers (of course farmers don’t listen to the Alarmists but you see the point). I can recall the drives up CR 437 around Lake Apopka back in the late 1980s and early 1990s. The trees in that area were smaller, and more easily protected, and had the huge lake nearby to add some warmth to the air. Just before turning onto 437, the route I took was East on SR50, and that route went past the utter devastation of the trees that had previously covered the Highland Ridge up and down the state, but only survived south of about I-4. On those droves that took place at this time of year, it was an incredible experience for a kid that grew up in the downtown of a city: If you never drove past citrus groves in full bloom, it is hard to describe it, and if you ever did, it is impossible to forget it. The smell of those blooms, light and delicate and so incredibly sweet, for mile after mile over rolling hills, overlooking Lake Apopka, which itself was lined with huge lush fields of vegetables growing on some of the world’s most productive farmland, was like being in Heaven. It smelled amazing, it looked amazing…it was amazing. It was Central Florida, even after the terrible freezes of the 1970s and 1980s…but before the developers took over. Once they arrived, it was just a matter of time. No grove of fruit trees is worth a fraction of the per acre price of a gated real estate development. That is what did in the groves once and for all. They would have eventually been replanted in citrus if the price of land had not gone through the roof. The history of Florida is a series of decades long periods of citrus boom and citrus bust, with the weather the big player. As far back as there are records, decades of excellent growing conditions were interrupted by sudden periods of hard freezes, usually coming in clumps lasting several years, or even decades. But citrus grows so fast in Florida, and those trees can bear so much fruit, that it was always replanted before very many years had passed after the past freeze, even if it was entirely new people deciding to do it. When I lived here in the 1970s for a Summer, the Turnpike from Fort Lauderdale to just South of Apopka was almost completely lined with trees on both sides, and in south Florida those trees were sitting in a few feet of water. I lived 1000′ feet from where the Turnpike crossed Delray Blvd, up a dirt road in the middle of nowhere…far from anything resembling development. By the next time I lived in South Florida in 2002, that area was unrecognizable. It was completely developed, and the houses looked like they had been there forever. There are some places that even in the 1990s were so far from where anyone was living, and so inhospitable seeming and God-forsaken it was hard to imagine anyone ever wanting to live there, which are today bustling cities and high priced real estate lining man-made lakes. Southwest Ranches was like that, and Weston…too many to name. When I drive past them it is very hard to reconcile my memories with what is there now. In fact, when I used to drive over to the area I live in now, back in the period btw 2002 and 2005, it is almost impossible to imagine how they are the same place. Cold weather and hurricanes used to end land booms in Florida, as people left after going broke or having their property destroyed. I used to think that was bound to happen again, when a strong hurricane hit a wide area directly and full force. Now I am pretty sure that will not happen. Too many people, and building codes have made it possible for a house to survive nearly any storm. But more than that…I look at places like New Orleans, or the areas around big rovers across the US, that flood repeatedly, and every time the pictures make one wonder why anyone would lie where water can rise so high. No matter how many times these places flood, it is always the same story, because people never move out of the flood plains, they just rebuild after the water goes down.